The final novel in Larsson's trilogy is just as action packed as its 2 predecessors. 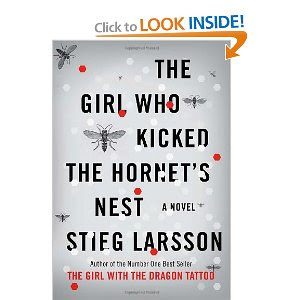 Hacker genius Lisbeth Salander is stuck in the hospital after being shot and buried alive while on the outside, governmental agencies, police officers and ex spies are all pissed that she can't just DIE already. And so, they continue to plot even worse things against Lisbeth once she eventually does recover. Lisbeth's main defender against all evil-doers is journalist Mikael Blomkvist. The extremely interesting thing about this novel is that it is so fast paced despite the fact that the heroine is in the hospital 95% of the time. What's even better is that the action is completely believable - no one is jumping off of buildings or setting bombs off; everyone actually uses their brain and nothing more advanced than a computer. Larsson (who unfortunately died before finishing the complete saga) provides a very satisfying conclusion to his trilogy.